Our roads cut through the great northern forest, follow lakes and rivers, cross alpine passes, track mountain crests and meander through tundra. 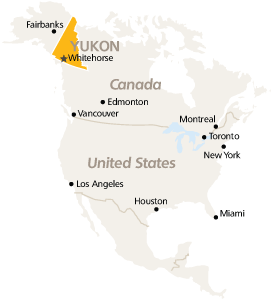 Whitehorse is the gateway to Yukon adventures. Whitehorse is just 2.5 hours from Vancouver, British Columbia by regular jet service. You can also fly from Edmonton or Calgary to Whitehorse. Yukon is right next door to Alaska, so you can easily visit both places on one trip. Drive anywhere in the Yukon and you’ll find a whole new experience, unlike any you have had before. Some of our open roads are truly special, and we have highlighted three of them here. This 600 kilometer circle from Whitehorse through the historic port of Skagway, Alaska, a ferry ride to scenic Haines, Alaska, and over the spectacular mountain pass to Haines Junction, Yukon and return to Whitehorse is all about diversity. Scenic railway journeys harkening back to the days of the Klondike Gold Rush are available from Skagway including the 3-hour White Pass Summit Excursion. Along the way, there are forests, lakes, rivers, and creeks… and that’s before you get to the wonderfully serrated Coastal Mountains which, like the road, descend to the Pacific. Once there you take a one-hour ferry ride and then follow the wild Chilkat River before the highway climbs above treeline to follow a fascinating alpine expanse, overlooking the snow-capped Alsek Mountains. There aren’t many highways that will take you through so much geographic diversity in so little time. But the Golden Circle does it. You feel like you’re actually riding through an experience. Even the locals never get tired of it. For anyone with a car, a truck or a motorhome, the Dempster really is the ‘trip of a lifetime.’ Why? Because there is no road like it. The Dempster is the only public road in North America that crosses the Arctic Circle. It starts at the Klondike Highway just south of Dawson City and it ends 734.5 kilometers later in Inuvik, NWT on the Mackenzie Delta, which flows into the Arctic Ocean. But it’s what happens between Dawson and Inuvik that gives the road its reputation. The Dempster is a wilderness highway — not a highway that runs through the wilderness. No, the Dempster itself is part of the wilderness. With few exceptions, there isn’t a building as far as the eye can see and you have that ‘wilderness’ feeling every inch of the way. You start off low in birch forests but soon open into expansive valleys backed by the spectacular Tombstone Mountains. As you climb into the Ogilvie Mountains, the views become phenomenal. Later, when you reach the Richardson Mountains, you get your first view of the tundra that covers the northern swath of North America. Along the way, you will take two river ferries over the picturesque Peel and the mighty Mackenzie. Then it’s a drive through beautiful wildflowers to Inuvik where the sun never sets In the summer. There is no road like it. The lust for gold sent the word ‘Klondike’ around the world in 1898 and the Klondike still lures people today. And why not? It’s a fantastic place to visit. This wonderful 1435 kilometer drive combines three highways: the Klondike, the Top of the World, and the Alaska. The North Klondike connects Whitehorse to Dawson City, in the heart of the Klondike. The highway winds through the bountiful boreal forest and crosses the Yukon, the Pelly and the Stewart rivers. You won’t speed through this route, you’ll linger, at the vistas, historic sites, campgrounds and anywhere the spirit moves you. You will kick up your heels when you get to Dawson, it’s that kind of town. For many, Dawson City and the Klondike were the end of an incredible journey during the time of the Klondike Gold Rush. There is so much to experience today that you will need at least an overnight, preferably more. A ferry ride takes you to the Top of the World Highway aptly named from the impression you get as you wind along the mountain spine with mountain top vistas to the left or right. It’s exhilarating. You feel on top of it all. You will shrink back to size as you drive the Alaska Highway along the perimeter of Kluane National Park. Kluane, the crown jewel of our national parks is home to Mount Logan, Canada’s tallest mountain and the largest non-polar icefields in the world. You can peek into it in places but to really see it…fly it, hike it, raft it…then you will really believe it. Yukon’s Kluane National Park and Reserve, along with Alaska’s Wrangell-St. Elias and Glacier Bay National Park and British Columbia’s Tatshenshini Alsek Park, form the largest international protected area in the world. These parklands are recognized and protected by the UNESCO World Heritage Convention as outstanding wilderness of global significance. Mid-May to mid-September (Note: generally speaking, fall begins late August in North Yukon through Mid-September in South Yukon).